Meat & Livestock Australia global manager for trade and market access Andrew McCallum addressing the Red Meat 2018 forum in Canberra. THERE have been many headlines about Free Trade Agreements and the billions of dollars in value they represent for the Australian red meat industry through the removal of tariff imposts on exports. But what do these deals actually mean at the farm gate? 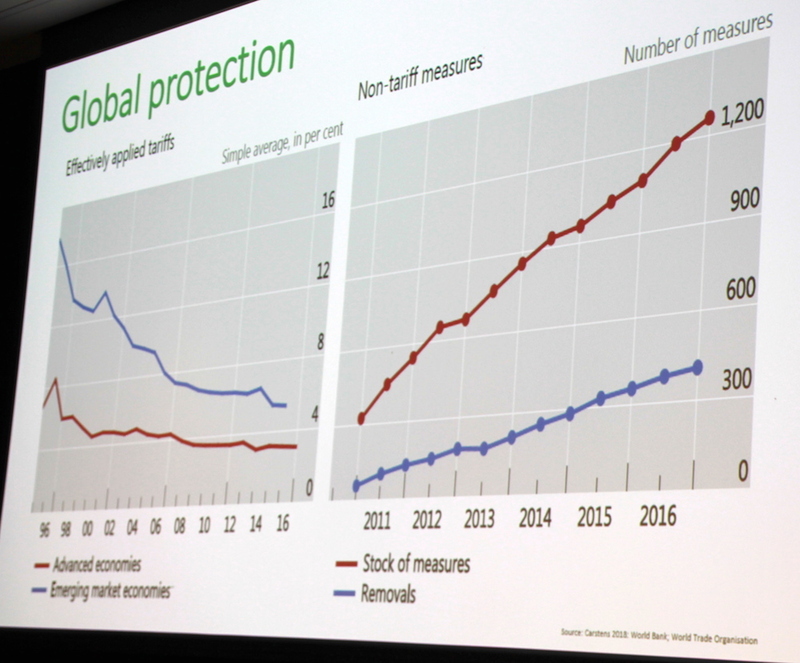 Meat & Livestock Australia global manager for trade and market access Andrew McCallum puts the figure from the China Australia Free Trade Agreement alone which came into force in December 2015 at an extra 8 cents per kilogram for Australian cattle producers, and 13-26c/kg for Australian sheepmeat producers. Mr McCallum told last week’s Red Meat 2018 trade and access market forum that the recent trifecta of bilateral FTAs signed between Australia and Japan, South Korea and China would be worth $20 billion over the next 20 years, just through the removal of tariff imposts on our product into those markets. 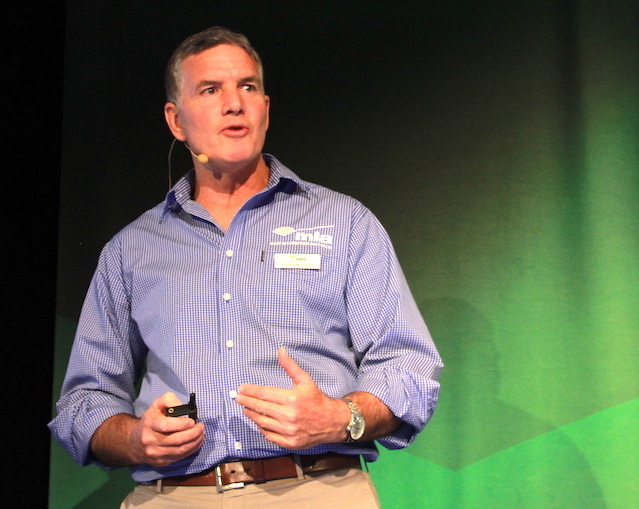 For the past 15 years Mr McCallum has headed up the Australian red meat industry’s market access program, which is jointly funded by producer and processor levies and focuses specifically on advocating for improved access and reduced barriers for Australian beef, sheep meat and goat meat. 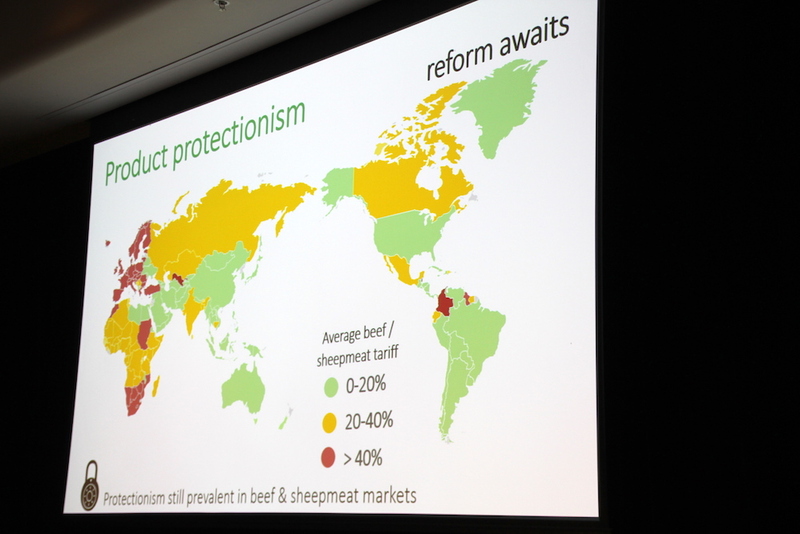 He told last week’s forum in Canberra that when he first came into the role in the early 2000s it was quite daunting, because Australian red meat faced market access barriers into almost every export market it sent product to, and many in markets that it did not then supply. The aim of the market access program is to increase the areas that are coloured green, denoting low to no tariffs. Collective efforts by the industry and the Australian Government in the past 15 years had made some quite useful inroads Mr McCallum said. The chart below left indicates how the number of tariffs imposed by developed and developing countries around the world has reduced in recent years. “The US imposing tariffs on China, China then retaliating and imposing US imposing tariffs US product, and similar with the European Union, and add to that the messy divorce between the UK and the EU, and it is quite a challenging global environment we face,” Mr McCallum said. Two current developments the industry is watching closely are the US push to claim the majority of the EU’s high-value 45,000t grainfed beef quota as its own, at the expense of other suppliers including Australia; and the prospect that Australia’s quotas for both beef and sheepmeat into the EU will be split between the EU and the UK, resulting in smaller quotas and less flexibility to trade around Europe. Mr McCallum said the market access program benefitted from market insights generated from MLA’s internationally-based staff who provided constant feedback on market developments in each region. Research based on those market insights showed that non-tariff barriers are currently costing Australian beef, sheep and goat industries about $3.4 billion per annum. “So that is lost value,” Mr McCallum said. Mr McCallum said that knowledge was used to identify priority areas to for future trade efforts. As a result the Department of Agriculture is placing six new agricultural counsellors in foreign markets, and the Department of Foreign Affairs and Trade had set up a non-tariff barrier division to help coordinate Government effort across non-tariff barriers. In addition to Government support, the most important thing the industry needed was to have “one message and multiple voices reiterating that same message”, he said. Future opportunities included the Australia’s free trade agreement with Indonesia, which has so far taken eight years to negotiate and is now close to being signed. The Trans Pacific Partnership whch comes into force on December 31 this year will give Australia improved access into new markets including zero tariffs into Canada and Mexico. The TPP also builds on the tariff reductions Australia has already achieved through its FTA with Japan and will further reduce those tariffs down to 9pc, potentially giving Australia a long term 30pc tariff advantage of the United States in that important market. Areas of priority the team is now focused on include negotiations to protect existing access and improve access to both the EU and UK; and negotiations to complete the Regional Comprehensive Economic Partnership (to create a free trade zone between the 10 Association of South East Asian Nations (ASEAN) and Australia, China, India, Japan, South Korea and New Zealand; and the negotiations for improved market access with the Gulf Cooperation Council in the Middle East. Mr McCallum said Australia was also working to improve market access into Taiwan and South Africa. How exactly does the MLA and Andrew McCallum ensure that cattle producers are seeing that 8c per/kg and sheep producers 13-26c per/kg? How is this measured?